A sci-fi story centered on a cyborg cop' efforts to bring down a nefarious computer hacker. Studio synopsis: Set in a world where people are enhanced with technology, Ghost in the Shell follows Major (Scarlett Johansson), who believes she was rescued from near death. The first of her kind, Major is a human mind inside an artificial body designed to fight the war against cyber-crime. While investigating a dangerous criminal, Major makes a shocking discovery – the corporation that created her lied about her past life in order to control her. Unsure what to believe, Major will stop at nothing to unravel the mystery of her true identity and exact revenge against the corporation she was built to serve. A "visually stunning" (Leah Greenblatt, Entertainment Weekly) "classic in the making" (Dan Casey, Nerdist), Ghost in the Shell also stars Takeshi Kitano, Michael Carmen Pitt, Pilou Asbæk, Chin Han, and Juliette Binoche. The film also boasts a Dolby Atmos soundtrack remixed specifically for the home theater environment to place and move audio anywhere in the room, including overhead. 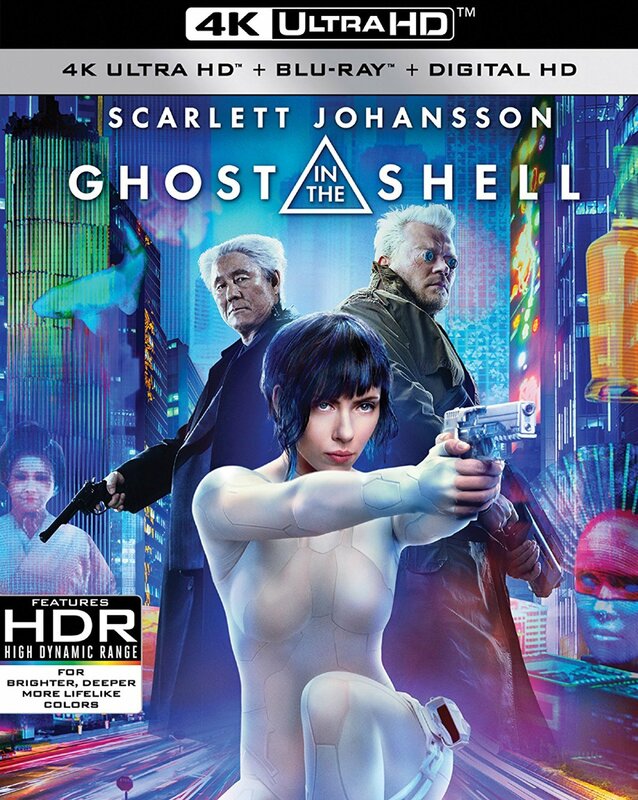 4K Blu-ray - 4K presentation of the film with English Dolby Atmos (Dolby TrueHD compatible), French 5.1 Dolby Digital, Spanish 5.1 Dolby Digital, Portuguese 5.1 Dolby Digital and English Audio Description with English, English SDH, French, Spanish and Portuguese subtitles.